Project’ to-dos (aka “issues”) are a really powerful tool to plan your activities. 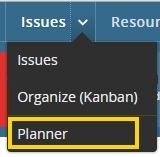 Twproject supplies you an issue planner that allows you to distribute the issues on a calendar. Of course every issue has “to be done on” a date, that can be set manually issue-by-issue, but Twproject planner let you do this process in a complete visual way. The first column contains “expired” or “not yet scheduled” issues. If you have not yet assigned issues a “unassigned” row will be shown. Just drag&drop issues in order to change assignee or set a new “to be done on” date. Remember that issues are always related to a project, so that you cannot move issues outside the scope of a task dates; if you try a warning will remember you the dates. If your issues have an estimates work, this tool could be used to plan work hours. In case you have an issue with 4 hours scheduled for Monday, in the operator load 4 hours will be “reserved” for that issue (exactly like the “plan” tool does). simple CRM: create a root project called “actions on contacts” and verify you will get notified for expired issues. Then record every “action” as issue (eventually record the work you spent on), and use the planner to schedule activities in the future. Your dashboard will show the issues for today and eventually you will get notified for pending ones. All material on this website is Copyright ©2018, Open Lab S.r.l. Adobe®, the Adobe logo, Acrobat®, ReaderTM, and Macromedia Flash PlayerTM are either registered trademarks or trademarks of Adobe Systems Incorporated in the United States and/or other countries. Sun, Sun Microsystems, Solaris, Java, JavaServer Web Development Kit, and JavaServer Pages are trademarks or registered trademarks of Sun Microsystems, Inc.
UNIX is a registered trademark in the United States and other countries, exclusively licensed through X/Open Company, Ltd.
Mozilla is © 1998- 2014 by Contributors to the Mozilla codebase under the Mozilla Public License and Netscape Public License. Netscape® is a registered trademark of Netscape Communications Corporation in the United States and other countries. Netscape CommunicatorTM is a trademark of Netscape Communications Corporation that may be registered in other countries. Microsoft®, Windows®, Windows NT®, SQL Server®, Microsoft Project® and Internet Explorer® are registered trademarks of Microsoft Corporation. Oracle® is a registered trademark of Oracle Corporation. Sybase® is a trademark of Sybase Inc.
MySQL is © 1995- 2014 MySQL AB under the free software/open source GNU General Public License (GPL). Suse is a trademark of Novell Corporation, Fedora, Red Hat, Red Hat Enterprise Linux of Red Hat Corporation. All other brand and product names appearing on this Site may be the trademarks or service marks of their respective owners.